Richard finished the wardrobe front panels today and the last job we did together was to glue and screw them to the side panels. His next task is to make and hang the doors. 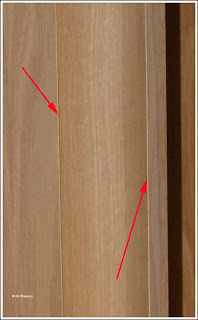 Richard carefully routed a small bevel on all the edges where the moulding joins the panels. This gives it a very nice finish. 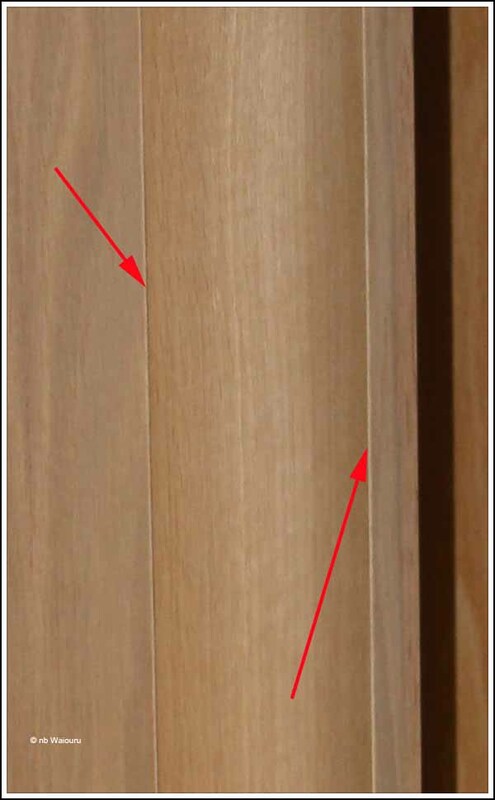 These little “extra” touches make all the difference between a good and outstanding finish! 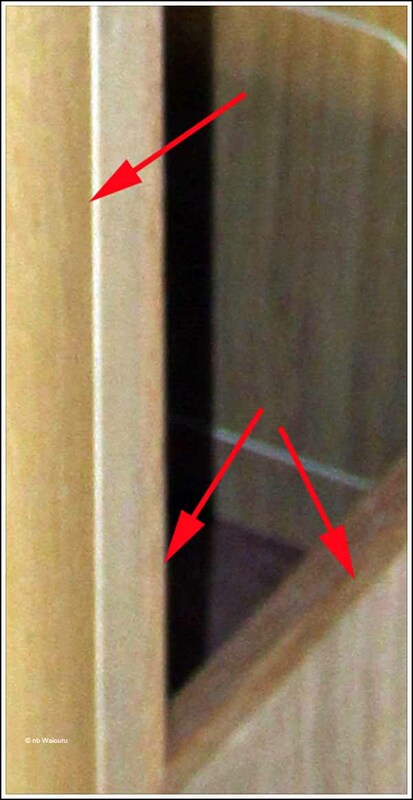 He has also trimmed the door surrounds with 15mm of solid oak. I’ve attempted to adjust the colour in the following photo to highlight the trim (lower red arrows). 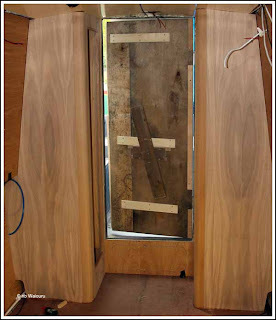 The doors will now be cut to size and the edges also trimmed with 15mm oak before being hung. There was another delivery today. 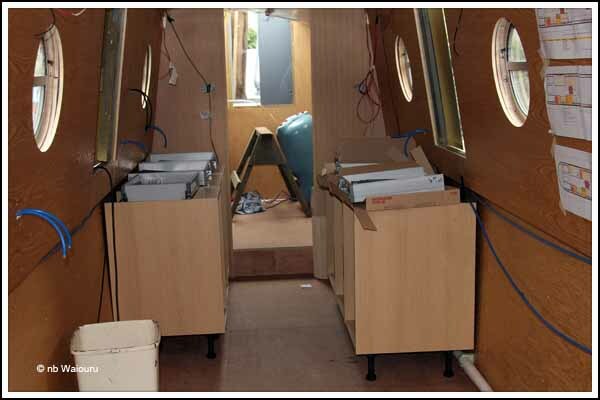 This time it was the galley carcasses and cupboard doors. 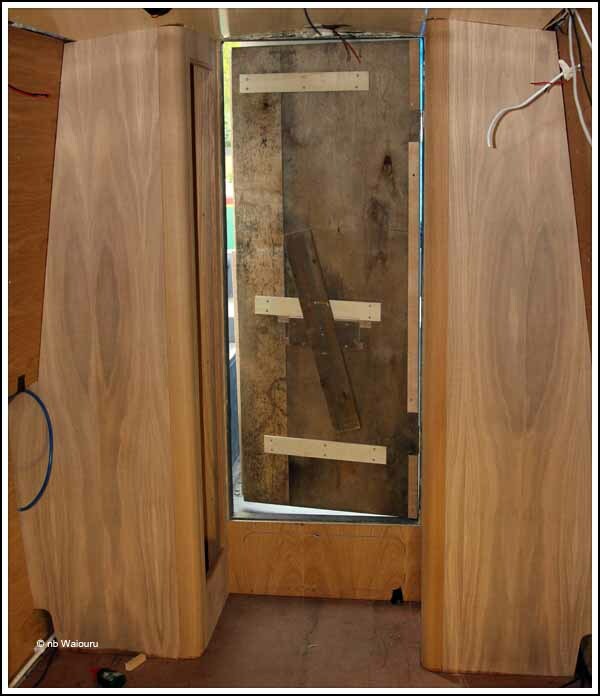 The carcasses are made from light oak veneer whilst the doors & drawer faces are of solid oak. I unpacked and assembled the drawers which have a ‘soft close’ mechanism. The carcasses are only roughly in place. We now require the wall oven so the location and size of the port side end cabinet can be finalised. It will contain the fridge, wall oven and microwave. Richard will also make the pantry cabinet on the opposite side of the galley. Jan has decided to have low drawers where the cabinet ‘kick-boards’ are usually located and Richard has already sourced a supplier. Two things you may have noticed in the photo above. The first is the hull line below the gunwale isn’t perpendicular. You might also have seen in the right side of the photo part of the boat layout plans I drafted. I keep referring to them when running cables or pipes. Monkeys on your back and I’m in the Black!